This talk explores the history and traces the realisation of a category that was invented by journalists, amplified by free market think tanks and converted into policy doxa (common sense) by politicians in the United Kingdom: the “sink estate”. This derogatory designator, signifying social housing estates that supposedly create poverty, family breakdown, worklessness, welfare dependency, anti-social behaviour and personal irresponsibility, has become the symbolic frame justifying current policies towards social housing that have resulted in considerable social suffering and intensified dislocation. The talk deploys a conceptual articulation of agnotology (the intentional production of ignorance) with Bourdieu’s theory of symbolic power to understand the institutional arrangements and cognitive systems structuring deeply unequal social relations. Specifically, the highly influential publications on housing by a free market think tank, Policy Exchange, are dissected in order to demonstrate how the activation of territorial stigma has become an instrument of governance. The ‘sink estate’, it is argued, is the semantic battering ram in the ideological assault on social housing, deflecting attention away from social housing not only as urgent necessity during a serious crisis of affordability, but as incubator of community, solidarity, shelter, and home. 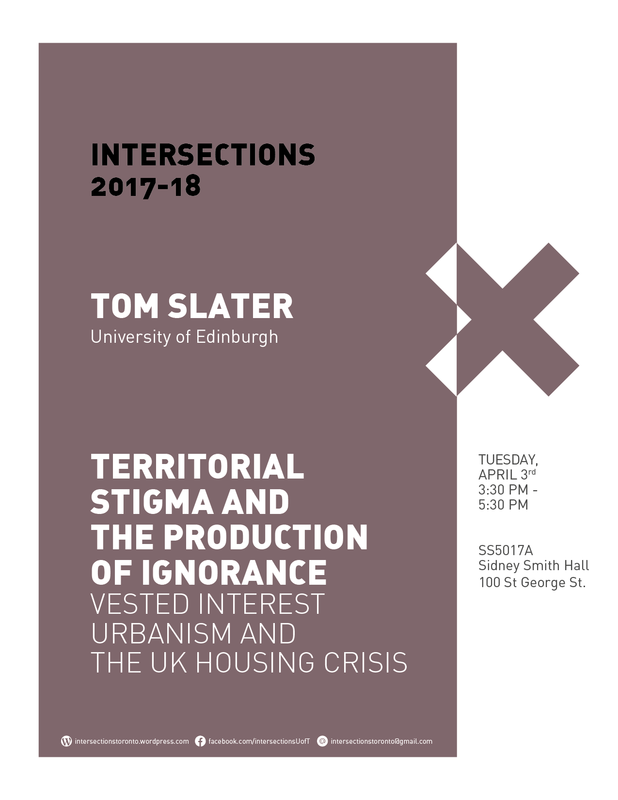 Tom Slater is a professor (reader) of urban geography at the University of Edinburgh. He is an author of numerous academic journal articles and co-author (with Drs. Loretta Lees and Elvin Wyly) of the widely-read book Gentrification (Routledge, 2008). He is also co-editor of The Gentrification Reader (Routledge 2010), and the forthcoming volumes The Sociology of Stigma (Sage) and Producing and Contesting Urban Marginality (Rowman and Littlefield).